Payment information is available on the Payment history screen. 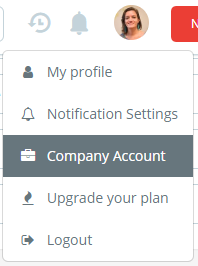 Click your name in the upper right-hand corner and then Company account. The Payment history screen can only be accessed by account administrators. Period: This column indicates the validity of the plan according to the payment of the contracted plan. Amount: This column indicates the amount charged or to be charged. Payments: This column indicates the payment method chosen by the customer. Currently, there are two options: invoice or credit card. Where can I find the invoice number? My credit card has been cloned, stolen, blocked, etc., and I need to change the payment method. How is that done? Select the form of payment and its desired frequency.